George "Sparky" Anderson's road to the Hall of Fame started in the 1950s as a light-hitting middle infielder for the Philadelphia Phillies. His Major League Baseball career ended nearly 40 years later as one of the most respected and skilled field generals in the history of the game, amassing more than 2,500 wins and three World Series titles. Some may not think that there is a demand for baseball cards of coaches and managers, but Sparky Anderson's success on the field makes him a popular target for card collectors. This top ten list looks at the key baseball cards for one of the league's most beloved managers. Shop for Professionally Graded Sparky Anderson Cards on eBay. Anderson's career in professional baseball began in 1953 as a middle-infield farmhand in the Dodgers organization. 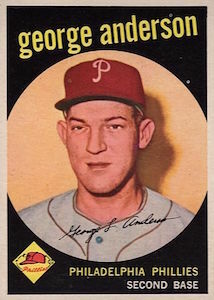 His only MLB appearance came during the 1959 season when the last-place Phillies used him as their regular second baseman. Struggling to hit, Anderson eventually took up a new role as a manager in the minor leagues. He later worked he way back to the show when he was hired to manage the Cincinnati Reds at the end of the 1969 season. Sparky Anderson immediately found success managing the Reds, leading them to a National League pennant in his first season. During his nine-year run as the team's manager, he led them to four National League pennants and two World Series championships. In 1979, Anderson moved over to the American League to manage the Tigers. He guided the dominate 1984 team to a World Series title, making him the first manager in baseball history to win a World Series title in both leagues. 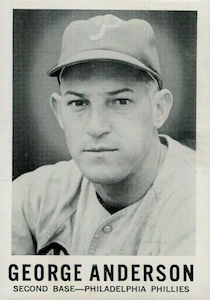 Sparky Anderson's first baseball cards came in the late 1950s and early 1960s as a player for the Phillies. When he surfaced a decade later as a manager, he also reappeared in the world of baseball cards. The popularity, on-field success, and immense star power of Sparky's "Big Red Machine" teams helped spur interest in his own baseball cards. Anderson's cards appeared alongside his players like Pete Rose, Tony Perez, Johnny Bench and Tom Seaver. Managers do not always get the limelight that star players receive from collectors, but there is a certain group of field generals that have earned a great deal of interest in the hobby over the years. Sparky Anderson's baseball cards would definitely fit this description. Collectors of the Reds and Tigers hold the Hall of Fame skipper in especially high esteem. His cards from his time spent as a manager continue to be popular, along with the few cards that were made of his time as an active player. 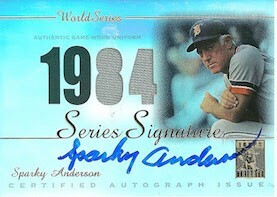 Adding to the totals, companies continued to produce cards of Sparky Anderson after his retirement. The following guide highlights ten of Sparky Anderson's best baseball cards. Ranging from his time as an infielder with the Phillies through his 26 years spent managing the Reds and Tigers, there are plenty of choices for collectors looking to add cards of one of the game's greatest managers. Sparky first took the reigns of the Detroit Tigers during the 1979 season. However, Tigers fans had to wait more than a year before he would make his first appearance on a card of his own. Topps did put him on the 1980 Tigers team card, but his picture is in a small frame in the top of the card. This portrait-style card has long been an affordable favorite of Tigers fans. 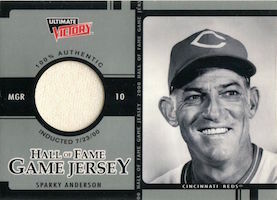 Sparky Anderson has made several appearances on relic cards over the years, but his Hall of Fame Game Jersey in the 2000 Ultimate Victory set was his first. There were only three relic cards in the set, but one of the other cards featured fellow Hall of Famer Tony Perez, who starred on Sparky's "Big Red Machine" teams, making this a popular card for collectors looking to quickly put together a complete relic set. Starting with the 1975 set, Topps placed a photograph of the manager on the team card. The card giant did not make solo manager cards again until the 1983 set. However, some of the team cards are still popular with collectors, including this 1975 Topps card featuring Sparky Anderson in small frame at the bottom right of the card. The Reds would go on to win the first of their two World Series under Sparky in the fall of 1975. The set has long been considered a groundbreaking design in the long history of Topps, which has made this Sparky Anderson card a popular option, especially amongst graded-card enthusiasts. Older minor league cards can be tough to find and can also be quite pricey, but collectors looking to add early Sparky Anderson cards to their collection might be surprised at the availability and affordability of this mid 1960s oddball option. 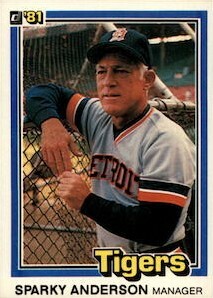 This card is the first manager card of Sparky Anderson and a popular favorite with his most die-hard collectors. 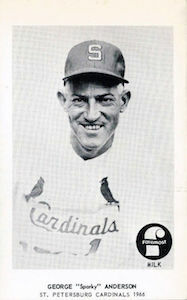 The card was issued during his time as a minor league manager for the Cardinals by the Foremost Milk Company. 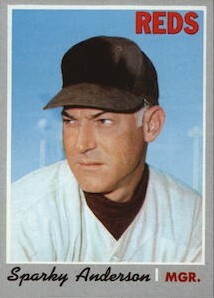 The 1960 Topps set marked Sparky Anderson's final appearance on a card as a player. Even though he only spent one season with the Phillies, collectors have become increasingly interested in his cards as a player. The card is a part of one of the best sets of that era, but the Anderson card is one of the more affordable Hall of Famers in this Topps classic. 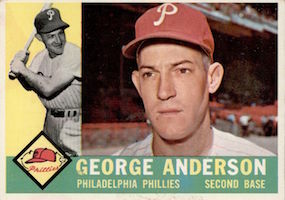 In addition to being featured in the Topps set, Anderson also appeared in 1960 Leaf. The black-and-white, portrait-style card is a little bit harder to come by than his Topps issue from the same year. The is largely because the high-numbered cards in this set, including Anderson, are short printed. Sparky's debut as a MLB manager came in 1970 after a successful stint as a minor league manager and one season as a coach for the San Diego Padres. 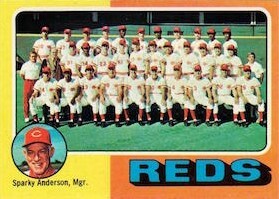 The Reds announced Anderson as their manager almost immediately after the 1969 season, giving Topps enough time to insert a card into their 1970 set. The card actually uses a photograph of Sparky as a Padres coach — note the brown undershirt — with the hat logo airbrushed out. Sparky signed for several different card companies following his retirement from the Tigers in 1995. Many of the options are on-card autographs and are featured in some of the better signature sets from the late 1990s and early 2000s. Card companies also did a nice job of splitting up his autographed cards between the Tigers and Reds. One of his more popular Tigers options is his 2003 Topps Tribute World Series Edition, which also features a relic piece, and commemorates his third World Series winning team. 2003 Topps included an autograph set, Topps Legends, which featured a wide array of Hall of Fame players and fan favorites from yesteryear. 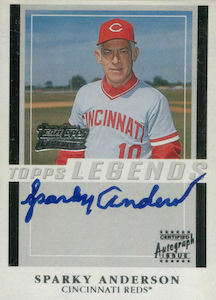 The Sparky Anderson autograph presented the Hall of Famer as a manager of the Reds, making the card one of his most popular autographs. While this card is not particularly difficult to find, it is short-printed in the set and can carry a premium. There are many Hall of Fame players featured in the 1959 Topps set, including Bob Gibson, Mickey Mantle, Willie Mays, and Hank Aaron. All of those cards are in high demand and will always cost collectors a hefty sum to add to their collection. The Sparky Anderson rookie bucks that trend. The card has become more popular with time, but also offers collectors the opportunity to own a rookie card of a Hall of Famer at a much more reasonable price. Even clean, raw copies, or highly-graded copies, are still well within reason given the set and the fact that you are buying the rookie card of a player enshrined in Cooperstown. Think we missed one? Let us know in the comments. I thought the horizontal 1978 Topps with the current pic as well as the black and white player pic, on top of the beautiful script team name is not only top 10, but close to the top. 1970 Topps Sparky Anderson autograph card.